Other Products: Flat back Rhine stones, butterfly (internet), Miniature train sands, Pearl pen creme, White marker, Distress Ink Vintage photo and Fossilized Amber, Glue gun, Big shot, White cardstock, Black Fine marker, Glitter Glue, pencil, Foampads, scor-pal, Stickles, Xacto knife. Instructions: Finished size is 5 3/4 x 6 x 2 inches. Cut 2 pieces of white cardstock at 5 3/4 x 10 inches, score at 2 inches on both ends. Cut another piece of white cardstock 5 3/4 x 8 inches, score at 1 inch on each side. On one of the 10 inch cardstocks, die cut the large circle in the center, on the 8 inch cardstock, die cut the second largest circle out in the center. Choose a panel from the backyard blossoms paper pad and trim to 5 3/4 x 6 inches. 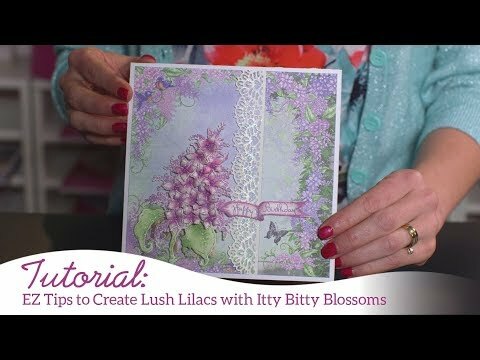 Fussy cut a cottage from the Lush Lilac paper pad. Use an Xacto knife to cut around a few flowers from the Backyard Blossoms panel, and tuck the cottage in behind it. Adhere this panel on the solid cardstock, and fold the scored sides forward. This will be the background. Diecut the Frame A Card die on white cardstock and trim one side off and adhere it to the backside of the 8 inch cardstock, so its visible from the left side of the circle. Fold the 1 inch sides of this panel back, adhere the sides of this panel onto the sides of the background, creating dimension. Take the 10 inch remaining cardstock, with the large circle diecut, and fold those sides back. Adhere those onto the sides of the background. This will create the diorama, now accessories as desired. Stamp three medium peonies in Rhubarb Stalk on white cardstock and die cut with the coordinating die, then color the center with Peanut brittle and the tops with Vibrant Fuchsia. Shape the flowers with the shaping tool set and adhere together creating on large flower. Stamp 2 of the extra small peony and 3 of the small peony with Rhubarb Stalk and die cut. Color the center with Peanut Brittle and the rest with Rose Madder. Stamp 4 Lilac petals in Rhubarb Stalk ink onto pink designer paper from the coneflower collection and die cut. 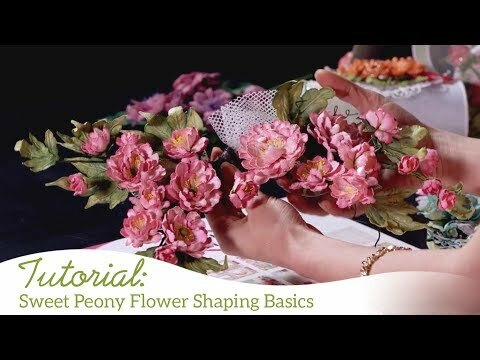 Shape using the Deluxe Flower Shaping kit and insert stamen in the centers. Stamp assorted coneflowers with Rich Cocoa ink on white cardstock and color them with the Vibrant Fuchsia ink or Fossilized Amber with Tangelo in the center. For the leaves I used a mix of the Bamboo Leaves and Leaf Green. Apply glue to the centers of the coneflower and add miniature train sand, allow to dry. Finish coneflower by adding a while line on the petals with a white marker. For the rest of the greenery and flowers use the Rain Boots and Blossoms collection and the Backyard Blossoms, stamp them on white cardstock with the Rich Cocoa ink and color them with a mixture of Bamboo Leaves and Leaf Green, Die cut all the leaves and flowers with the coordinating dies and shape them with the Deluxe Shaping tool set! Assemble as shown. Finish with Rhinestones and adding Pearl Pen drops on to desired pieces.